Entry level triathlon shoe that delivers high performance for the enthusiast triathlete who wants excellent performance without breaking the bank. The quick dry interior keeps foot comfort levels high after your swim leg. The T320 sole is constructed from a glass fibre reinforced-polymide sole for excellent stiffness and power transfer. You can use both types of cleats (SPD-SL and SPD) with this shoe with the fixing having a wider cleat adjustment range also. 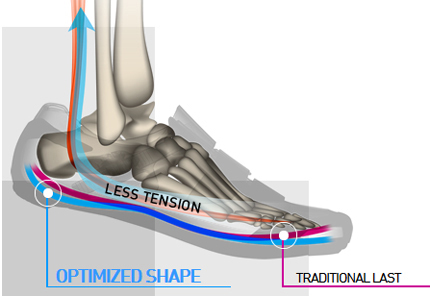 The toe-spring section of a cycling shoe plays a key role in supporting efficient pedaling. Too high, and it causes increased tension in the plantar, calf, and hamstring muscles. Too low, and you get a bowlegged, inefficient pedaling form. Extensive research by Shimano's R&D experts has produced a superior shoe last design with an optimised toe-spring section that promotes a smoother, more energy-efficient upstroke. Built based on feedback from pro riders, Shimano Dynalast helps reduce energy loss on long rides, letting you keep more in the tank for that final sprint to the line.